New Jersey Democratic candidate Andy Kim will attend a fundraiser Friday night with Sen. Elizabeth Warren (D., Mass. ), who voted at least three times against bills to fund projects at Joint Base McGuire-Dix-Lakehurst, which is located in Kim's district. Sen. Elizabeth Warren (D., Mass.) will attend a fundraiser for Kim, a candidate in New Jersey's 3rd Congressional District trying to unseat Rep. Tom MacArthur (R., N.J.), and Tom Malinowski, a Democratic candidate in the state's 7th District. The fundraiser is being held in Short Hills, New Jersey at the home of former mayor Jun Choi and his wife, Lisa Lee. Kim, who was accused of inflating his national security credentials during the Obama administration, has slammed Washington dysfunction and talked about how it hurts the military base in his district, but he doesn't seem to mind fundraising with Warren after she stood against critical funding for the base. During fiscal year 2016, she voted against barring the retirement of the KC-10, an aerial refueling tanker and transport aircraft primarily stationed at McGuire and one other base, and providing $2.3 billion in funding for the new KC-46 program, in H.R. 1735. The KC-46, whose deliver has been delayed but is now expected to hit the fleet in early 2019 if not later this year, will primarily be based at McConnell Air Force Base in Wichita, Kansas. McGuire, along with Travis Air Force Base in California, were later selected as the preferred locations for the next two active-duty-led KC-46A Pegasus bases. The aircraft will begin arriving at McGuire after the fleet at McConnell reaches a "sufficient size," according to the Air Force. Warren also voted on S. 2943 against $2.9 billion in funding for KC-46 procurement and $4.6 million for KC-10A procurement during FY 2017. The Air Force continues to depend heavily on the KC-10, at least during the KC-46's development. The third vote came on FY 2019 funding when she voted against H.R. 5515, which included $2.06 billion for procurement of 12 KC-46A aircraft and $50 million for interim contractor support. The National Republican Congressional Committee slammed Kim for putting the interests of his liberal allies in Washington over the interests of the district he's running to represent. 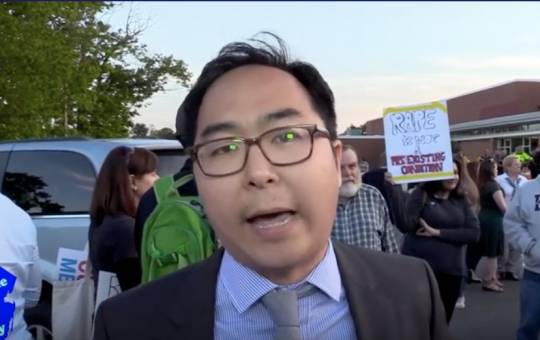 "By aligning his campaign so closely with Elizabeth Warren, Andy Kim has proven once again that he will put the interests of his liberal Washington allies over New Jersey's Third Congressional District," Chris Martin, a spokesperson for the group, said. MacArthur released a statement slamming Kim for aligning himself with Warren, who he says has tried to put the base's "future in jeopardy." "While I have successfully fought against Washington dysfunction to help secure the Joint Base, extremists like Elizabeth Warren have put its future in jeopardy," MacArthur said. "Andy Kim has a choice to make – and it should not be a difficult one. Either he stands with the Joint Base and the people of Burlington and Ocean Counties or sells us out to stand on a stage with a radical politician like Elizabeth Warren, who repeatedly voted to block the very mission that secured the future of the Joint Base." This entry was posted in Politics and tagged 2018 Election, Elizabeth Warren, Military, New Jersey, Obama Administration. Bookmark the permalink.